Development tools: Five sets of NI ELVIS™, NI ELVIS™ II+, NI Single-Board RIO, Xilinx Spartran-3AN FPGA starter kits, and Xilinx CoolRunner-II CPLD starter kits and ten sets of NI myRIO and Digilent ZYBO Zynq™-7000 development boards were used to lecture data acquisition, circuit design, and embedded system in a hands-on style. Three sets of NI PXI were used to develop space payloads, 2 portable NI USB DAQ to measure signals in field, 2 NI USB OEM for developing I2C/SPI interface, a NI CompactDAQ to measure parameters in environmental tests, and 6 sets of NI CompactRIO to develop and deploy measurement system. 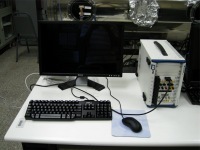 Bench-top equipments can monitor/calibrate the electric circuits of the payload. Computers and peripherals: Two Mac mini Servers provides internet services for SPL and AIP. 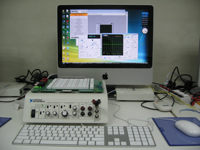 Seven iMac are used to design circuits with NI ELVIS and Single-Board RIOs. Ten Dell PC desktops are used to monitor the SPSC, control the PCB fabrications, design and simulate 3D models, and control NI ELVIS II+. Two ASUS PC desktops and two ASUS notebooks are used for computing and measurement. Ten ASUS PC notebooks are used for students participating science mission training. The peripherals are used to support the operations of these computers. Network: the lab provides both wired (10/100/1000 Megabit ethernet) and wireless (802.11a/b/g/n) network connection to the Internet. and Signal Processing and Communications Option Components), NI Circuit Design Suites bundled with ELVIS and one Power Pro, Xilinx Vivado Design Suite: System Edition, University License 25 Licenses, AGI STK Pro and EAP, etc. 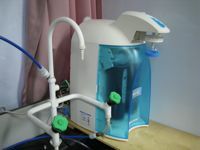 Others: Basic facilities to maintain environmental conditions with air conditioners, dehumidifiers, an air cleaner, a refrigerator, dry boxes, a hood, an ultra-pure water system, a clean booth with a clean bench, etc.